Definition at line 18 of file IcmpPinger.h. Definition at line 25 of file IcmpPinger.cc. Definition at line 32 of file IcmpPinger.cc. Referenced by Icmp6::SendEcho(), Icmp4::SendEcho(), and stubIcmp::testChecksum(). Definition at line 148 of file IcmpPinger.cc. References Icmp::Close(), icmp4, icmp6, and Icmp::icmp_sock. Referenced by main(), Recv(), SendResult(), and ~IcmpPinger(). Referenced by Icmp4::Recv(), and stubIcmp::testHops(). Definition at line 47 of file IcmpPinger.cc. References _db_init(), buf, DBG_CRITICAL, DBG_IMPORTANT, debugs, getCurrentTime(), Icmp::icmp_sock, MYNAME, NULL, O_BINARY, socket_from_squid, socket_to_squid, Win32SockCleanup(), and xstrerr(). Definition at line 163 of file IcmpPinger.cc. References Close(), DBG_CRITICAL, DBG_IMPORTANT, debugs, HERE(), icmp4, icmp6, Ip::Address::isIPv4(), Ip::Address::isIPv6(), pingerEchoData::opcode, pingerEchoData::payload, PINGER_PAYLOAD_SZ, pingerEchoData::psize, Icmp6::SendEcho(), Icmp4::SendEcho(), socket_from_squid, and pingerEchoData::to. opcode Specific code for ECHO request, see RFC ????. payload A payload MAY be sent in the ICMP message. Content longer than MAX_PAYLOAD will be truncated. len Length of the payload in bytes if any is to be sent or 0. Definition at line 40 of file IcmpPinger.h. Definition at line 216 of file IcmpPinger.cc. References Close(), DBG_CRITICAL, debugs, HERE(), socket_to_squid, and xstrerr(). Referenced by Icmp6::Recv(), and Icmp4::Recv(). 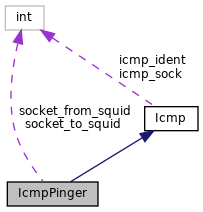 Referenced by Close(), IcmpSquid::Close(), Icmp::Close(), Icmp::Icmp(), Open(), IcmpSquid::Open(), Icmp6::Open(), Icmp4::Open(), IcmpSquid::Recv(), Icmp6::Recv(), Icmp4::Recv(), IcmpSquid::SendEcho(), Icmp6::SendEcho(), and Icmp4::SendEcho(). Referenced by IcmpPinger(), Open(), and Recv(). Definition at line 47 of file IcmpPinger.h. Referenced by IcmpPinger(), Open(), and SendResult().